I “allowed” myself a little while yesterday of reading blogs that I’ve missed out on the last…. two years? My blog reading these days is spotty because my time available is spotty. Don’t get me wrong. I didn’t have this excess of time yesterday. I had a billion other things I *should* have been doing. But I’ve missed my blogger friends!!!!! And really, I’ve missed friends in general. Oh, I comment occassionally on facebook or when I see a tweet. And I LOVE the friendships I have with those who take the time to read MY blog and comment on my own facebook/twitter stuff, but between my own blogging, working on book stuff, being a momma to my kiddos, and taking care of Annabelle’s special needs, there just isn’t that much time left to go seeking others out. And that makes me sad, because at my heart, I’m a social person! Is it odd that half the people I know think I’m introverted and the other half think I’m super extroverted? Does that make me an introextrovert? I guess it just makes me… me, huh. I’ll let you in on a little Krista secret: How “social” I am with you is in direct correlation with how comfortable I am. Out of my comfort zone, and I freeze up. I get scared I’ll say the wrong thing, I jumble up my words and sound just stupid. When I’m comfortable and relaxed, you’re searching for a muzzle to make me shut up. On my blog… I’m super comfortable. I have to go back and delete words so my blog posts aren’t miles long! Kiddos are starting school today. I’m excited. I miss them going to school. I know… I know… I’m supposed to be super-mom that sniffles that my kids are leaving me and that I have to suffer through their absence for eight hours a day…. But this was my first summer home with the kiddos by myself. And it was a HOT summer, so we were confined to the indoors most of the time. We’re all a little tired of the summer and ready to get on a schedule that allows the kids to have organized stuff to occupy them, and ME to have time to focus on Annabelle’s therapy and maybe, possibly…. be a little more social minded? Connecting with others? Not being such a hermit confined in my messy dwelling? Forcing myself outside of that cozy comfort zone?? I might actually keep my house clean a little more, too. Imagine that! Yes, this was my lawn aka field. otherwise I wouldn’t be admitting to this! *Side note* have I mentioned my high dislike of mowing the lawn? Poor hubby has been working like crazy the last few weeks, otherwise he’d have done it. 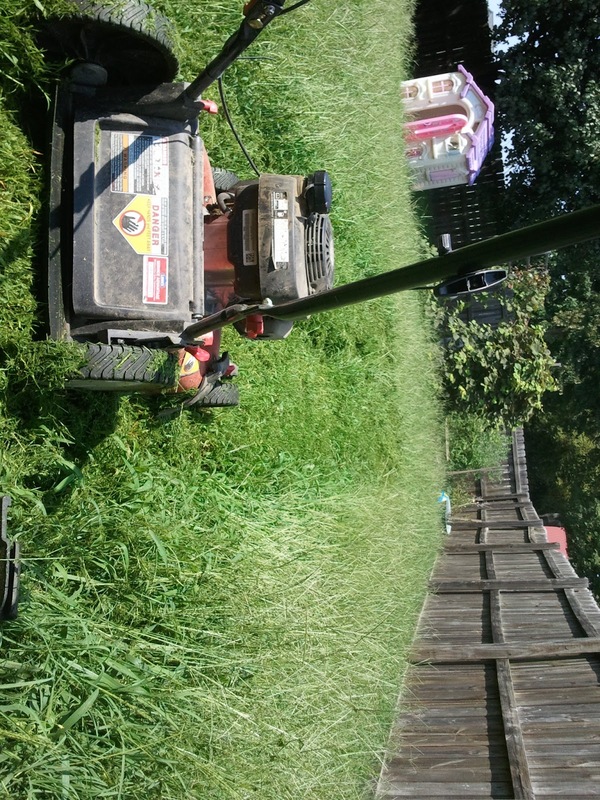 I refuse to mow in 100 degree heat, or I’d have done it earlier…. 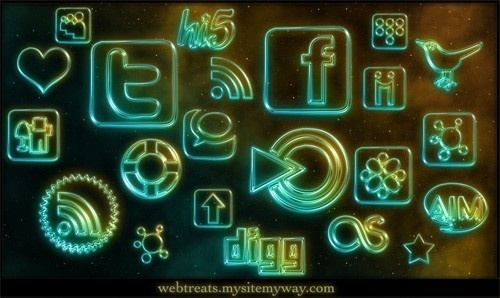 Discussion: How do you manage your “social media” time? With this newfangled stuff called blogs/Facebook/Twitter… do you find yourself spending more time with “virtual” friends rather than real ones? Would you call yourself an introvert or extrovert… and does that change depending on who you’re with? Or am I the only one with split personalities here…. I find my self spending more time on social media this summer especially with it being so hot this summer. Once school rolls around I will be more occupied and have a schedule which I love. I do find that it's easier to connect with peoLe online than face to face because they are always there and you don't have to set up a time to meet. They can't judge you for things and some of my blogger/twitter/facebook friends are nicer than my real friends. Thanks for posting this. I love your blog!! Ohhhh, i think the whole "always there" thing is a huge thing for me too. I can see if they are on facebook, or I can send them a message and they can reply back when they get a chance. Same with a blog. I worry (I'm sure needlessly) about bugging people "in person" because I KNOW we all have busy schedules. Although i have dreams of getting back to the days of, "Come in this house" without "preplanning". I love social media, if only because I have contacts all over the world. And some have become real friends over the years, which is something I never thought possible. It's very tempting to sit behind my computer for hours, especially when I'm on vacation. When school starts again (I'm a teacher) I won't have that much time of course. And I'm in the middle of deciding which social media I will keep and what I will end. Having multiple sites is far too much work, lol. I try to make sure I spend as much time with my "real-life" friends, though. I love to go out for lunch or dinner with them or just have coffee and talk (I have no kids to look after so that's easy for me). Awww, thanks Riete!!! I LOVE getting to know others from other countries, too!!! And ditto… I need to regulate my time!!! I used to be totally extroverted but now, after many hurts from people who I thought had my back and were my friends I tend to be more toward the introverted side. People who I am really comfortable with and I trust then I'm still the same old me as I've always been. However, to the rest of the world they probably think that I don't talk much, am shy, and stuff like that. It is what it is. I think all of Logan's special needs have also added to that some. On the outside no one would know anything is wrong so many many people doubt, question, and such. No one realized what goes on behind the scenes to keep Logan where he's at and to keep making progress. Let alone, how much hard work it took to get there. I totally get that, Rachelle. It's hard when people are mean. *sigh* I've encountered plenty of those people myself, but I kinda live by the motto… they can't hurt me unless I let them. It hurts in the moment but I try my hardest to let go of it in the long run. Easier said than done though!! I thought I was the only introextovert! Glad to know I am not the only "weird" one 😉 A few months ago we moved away from all our friends and family to a city where we didn't know anyone (expect my husband's boss, and that was just through his work). I didn't think I am quite as introverted as I have now realized I am. I had "built in" friends and family relationships from years of knowing them. Like Rachelle, I too have experienced deep hurt from people who I though were my closest friends and, while I knew that affected me, it has been made more real when it comes to having to start new with people I don't know at all. All that said, I find myself longing for the strong connections I already had and end up spending WAAAY too much time on the computer keeping up with those I love and know love me already. I have been following your blog and praying for you all for over a year and a half now. I so appreciate your honesty and transparency! yeah… not posting pictures of my master bedroom!!!!! I like that though… stuff just growing like the lawn. THAT'S why my house is always messy no matter how much I try to clean! Moving is SO hard! It's probably one of the reasons I am how I am too. We've been in the same city for quite a few years though, so we plan to stay put for a while so we can sink in our roots! I'm like you, in the fact that I'm an introextrovert … it depends on how comfortable I am in my surroundings and the company I'm keeping. I am a social person but the only way I socialize in the world of the internet is through emails and blogs. (I'm one of those rare oddities who have yet to get a FB account or a Twitter account. Maybe soon, but I don't know that I'd have the time currently to keep up with it. I am an extraintrovert. Not extra introvert. Just saw Tammi T is the same. To me I can respond how I feel. It's not so much who I am with, but how my coping-laughing-being nice- willing to listen strategies are coming together.